When a tool only gets used for literally a few minutes per month, it is easy to brush it off thinking that quality is not so important. This is definitely the case with electric nose hair trimmers. I am here to change that. I want you to use better grooming products that do a good job, last a long time and won’t break the bank. Enter the ToiletTree nose trimmer. Its name may be a little bit silly, but they are very good electric nose hair clippers that you should keep in your Dopp bag or in your medicine cabinet in your bathroom. It deserves a place among your most trusted grooming gear. To read up on just how you should trim your nose hairs, check out this helpful grooming guide for your nose. Let’s dive into this ToiletTree nose trimmer review and see what makes it one of the best nose hair clippers than others on the market. Even the company admits that the name is silly, but they are a family company that is serious about creating intelligent products. Since it is a family business, they actually care about making products that help people. Which is smart since that is how you build brand loyalty. Nose grooming may not seem important to many, but they took it seriously enough to make the best nose trimmer on the market. ToiletTree products are sold via Amazon.com mostly since it has the best supply chain logistics that works great for a smallish company like ToiletTree. They have won various awards from Consumer Reports and Hammacher Schlemmer Institute for their grooming products, and toiletries, pun intended. For this review, we’re just talking about the ToiletTree nose and ear trimmer with LED light and stainless steel body. I just wanted to shine a spotlight on them as a company for a moment as I like to support small family companies like this one that deserves our business. 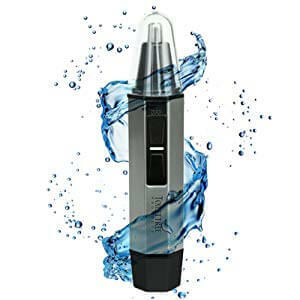 At just about four ounces, this electric nose hair trimmer is so light that it belies what a powerful motor it has. It is equipped with a rotary motor with blades that rotate rather than rock back and forth. This makes it very efficient, power wise, to get the most out of the motor. Run by a AA battery, it doesn’t need to charge or be plugged in, yet is powerful enough to cut even thick, wiry hair easily without painful pulling. Made out of stainless steel, the blades of this ToiletTree nose hair trimmer are very sharp. Ideal for longer nose hairs, they cut cleanly and leave only the tiniest bit of stubble. Using stainless steel is also hypoallergenic so people with sensitive skin or allergies won’t end up with a rash or worse from using it. The ToiletTree nose hair trimmer can be used in the shower since it is totally waterproof. As long as you don’t try to open the body of the nasal hair trimmer while using it, then you don’t have to worry about the battery getting wet. If you use it dry, in front of the mirror for instance, then you can clean it easily by running it under the faucet. How useful this feature actually is, really depends on the user’s perspective. Some people may find that it is just another bell or whistle to use as a selling point for a nose trimmer that has no real value. others may feel it puts it up there as the best nose trimmer. It definitely does help a bit, but when the ToiletTree nose trimmer is running and the nozzle is in your nostril, it isn’t like the light can get in there for you to see if you got all the hairs. It does help if you use it as a flashlight to check things out, but not really useful while you are trying to trim down your hair. Though the ToiletTree nose trimmer does have some plastic parts, the fact that most of the ToiletTree nose hair trimmer body is made of durable stainless steel is a nice feature. Since things get wet when using in the bathroom, it is easy to let something slip. It’s nice to know that if you drop these nose hair clippers, it isn’t doomed to shatter into pieces. Not that I recommend dropping it to test its durability, but I feel the construction is solid enough to survive some bumps and bruises. To get started, you will need a AA battery since one is not included. Try to get the best one you can since you don’t want to be constantly replacing batteries. How long it lasts depends on the quality battery you use. The top cover over the blades is just the right size for getting into your nostrils and to move it around. The size is ideal for tilting it at an angle to get right down to the base of the nose hair leaving only the slightest stubble. Depending on how quickly your hair grows, this should be tight enough of a shave to give you a couple weeks before you notice the nostril hair making a comeback. The hairs can get in to be cut on top or to the side of the head since there are slots on top and on the side. Since the top is covered, you won’t end up with nicks from exposed rotating blades. The housing of the top is made of stainless steel, as well, so it doesn’t buzz around. This may seem like an odd thing to point out, but those with sensitive noses will understand how nice that is. Essentially, the lack of a buzz makes for a sneeze-free experience. I have a sensitive nose and used to often end up in a sneezing fit when trimming my nose hair with a nose hair clipper. You can even use this for ear hairs that are growing inside your ear. You probably won’t get the hair growing outside due to the shape of the blade housing. 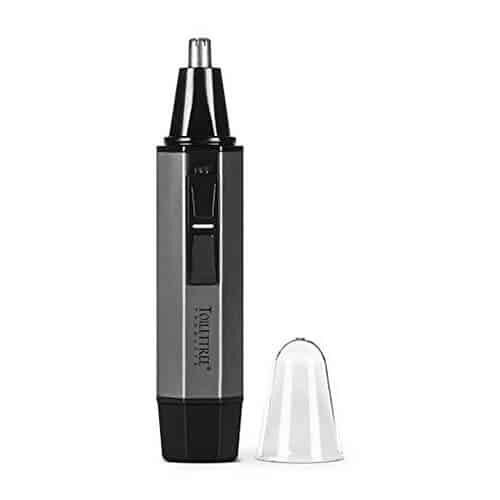 But, if that isn’t a problem for you, then this can be a nice 2 in 1 nose and ear hair trimmer providing even more value for you. I really like ToiletTree products in general, as I mentioned, since they do care about their customers. Their customer service is very good and they make a point to respond to all inquiries and do what they can to fix any problems. As far as this ToiletTree nose trimmer, I have to say it is one of the best out there. Compared to many of its competitors, it does a better job and lasts longer. I’ll repeat, since most people aren’t looking for much from a nose hair trimmer, some companies will cut corners and not offer up much in the way of quality. That definitely is not the case here. Whether you use it at home, or in your travel toiletry bag, in the shower or in front of the mirror, you will get a few years use out of it. Have any questions about the ToiletTree Nose Trimmer or other trimmers? Leave a comment in the box below!